By Antara Dasgupta in Government Schemes, PMAY on May 19, 2018 . Pradhan Mantri Awas Yojana (PMAY) is an initiative taken by Prime Minister Narendra Modi with an objective to provide financial assistance to Economically Weaker Section of the Society, Low Income Group (LIG) and Mid Income Group (MIG) for house purchase and construction purpose. Priority will be given to senior citizens and differently abled while allotting house on the ground floor. Under this scheme, the house will be allotted in the name of the matriarch or in the name of jointly the male and female head of the family. Therefore, the applicants should mention the name of their mother or wife at the time of the registration. Government is taking a step towards creating an environmentally safe household as this scheme is taking up eco-friendly and environmental methods to build the house. The beneficiaries will be provided 6.5% interest subsidy on the housing loans, for 15 years. Look for “Search Beneficiary” option and click on “Search by Name” link in the options menu. 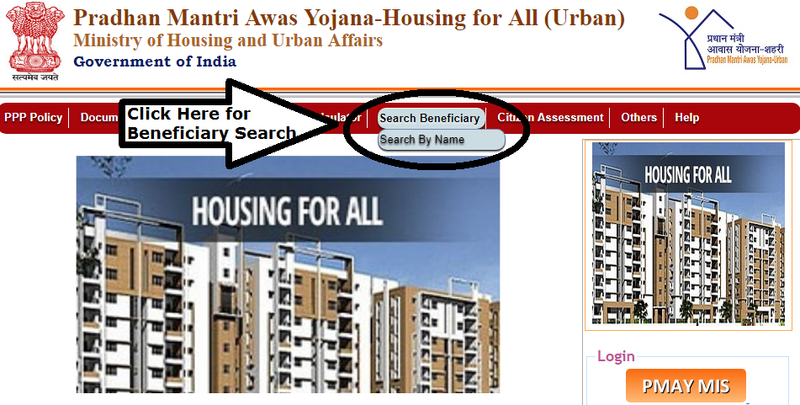 After clicking the show button, a list of beneficiaries matching your name would be displayed on the screen along with survey code, fathers name, component name, city name and state name. You can view the complete details by clicking the beneficiary name and then entering your mobile number and verifying it with the OTP. This social welfare program by the Government is aimed at providing shelter for all by 2022. However, the main focus will be on people who belong to the EWS and LIS categories.